That a hopper will not eat? And they’ve helped themselves to wheat. After hoppers have their fill. Lord, they’ve even nipped our will. There’s just grasshoppers, that’s all. Do they dare to come on through? What next to be their liking? Hopefully not me or you! As we reflect on the women who raised us this Mother’s Day, S.D. Farmers Union would like to celebrate the many women who support the state’s number one industry – Farm and Ranch Moms! Growing up, Corrie and her sisters were actively involved with day-to-day operations of their parents’ farm and purebred Charolais operation. 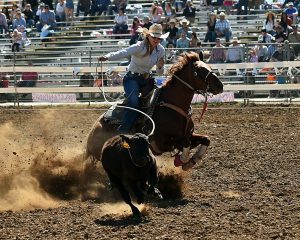 Actively involved in 4-H, FFA and the American Charolais Association, the girls especially enjoyed traveling to cattle shows. In fact, it was during a Texas cattle show that Corrie met her husband, DJ, in June 2000. Raised in Arkansas, DJ traveled to South Dakota to meet Corrie’s family and decided to stay on to work for Alan. The couple married in 2001. Today, DJ continues to work with Alan, while at the same time the couple is building up their own herd. Corrie works fulltime for Natural Resources Conservation Services (NRCS) as a Soil Technician. Working fulltime and making weekly, nearly 200-mile trips to doctors in Sioux Falls was a lot to handle. And, Corrie says it was stressful – but completely worth it when in 2008, with the help of IVF, the couple welcomed Hadlee into the world. In 2011, their second daughter, Bentlee, arrived thanks to intrauterine insemination, and with no medical assistance at all, Cambree arrived a little more than a year ago. Instilling curiosity for nature and the world around them are reasons Audrey “Jaton” Keierleber is glad she was able to raise her now grown daughters, Brecky Cwach and Christine Wood, on the family’s Colome farm. “On the farm there are so many more opportunities for them to do and try – like working with plants and livestock and seeing firsthand how nature works,” explains Audrey, a retired High School Family & Consumer Sciences and Middle School Computer and Science teacher. Today, both her daughters work in STEM (Science, Technology, Engineering & Math) careers. Brecky works in electronic commerce as a bond underwriter for Philadelphia Insurance Company and Christine works as the SDSU Extension 4-H Science Technology Engineering and Math (STEM) Field Specialist. Their first two years of marriage Audrey commuted to White River, more than 68 miles to work, until she was finally able to get a teaching position in Burke, 28 miles from their place, and later in Winner, 8 miles from home. “It was nice to live close enough to town that our girls could be involved in 4-H, FCCLA, FFA and church activities,” Audrey says. In retirement, Audrey started her own quilting business, Audrey K’s Long Arm Quilting. She constructs traditional quilts, finishes quilts and makes t-shirt quilts. Opal Grubl, 85, mother of five: Vicky Leitaker, Donna Whitehead, Jacque Lamphere, Vonda Andersen and Connie Johns grandmother to 13 and great-grandma of four. 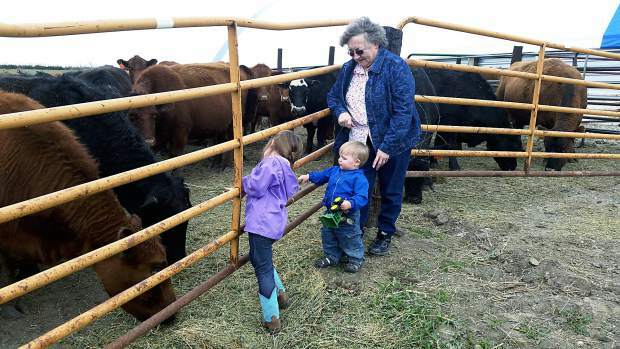 Born in 1931, the youngest of eight children to two South Dakota homesteaders, Joe E. and Ida May Price, Opal Grubl recalls her childhood with fondness. She continued to teach until she and Donald welcomed their first daughter two years after they were married. “I helped him on the ranch until I got the girls. I could no longer go out because I always had one little baby,” she explains. In 2012 Opal and Donald handed the ranch over to their grandson, Lane Lamphere, and moved into a home in Boulder Canyon. The couple will celebrate 60 years of marriage this June. After her children left home to start lives and families of their own, Opal began writing poetry which reflects her family and ranch experiences. She continues to write poetry and enjoys reading.